The Orange County Fair, ranked as the 11th most attended fairs in North America, with 1,072,018 attendees (OC Register Wiki) will end this weekend. Open from 10am to midnight on the last few days, many events are included for free at the OC Fair. Enjoy the last days of deep-fried delicacies, heart-stopping rides, rockin’ concerts and more for the whole family (OC Fair Newsrelease, Aug. 9). With a carnival, petting zoo, extreme sports acts, acrobatics, live music and more, the OC Fair has always offered fun for everyone (OC Register Wiki). In 1890 the Orange County Farigrounds were founded and after many headline news this year, Governor Arnold Schwarzenegger sold the Fairgrounds to the City of Costa Mesa for $96 million this June, just before the official start of the OC Fair. Should you have missed the OC Fair and are longing for some “Jahrmarkt” adventures, then prepare yourself for the LA County FAIR starting Sept. 4th to Oct. 3rd, 2010. Summer in Southern California means diving not only into the waves at the beach but also into the wealth of attractions and fun activities offered by every city along the beaches but also inland. Great about it is, that most of the fun is FREE! Look at the endless beaches. One always can find a great spot and enjoy a whole day at the beach without paying prime time money to secure a nice sunspot contrary to being on the Italian or French riviera. Most often the beach cities are offering a whole entertainment program for free as well. Look out for movies or concerts at the beach or street fairs. Check out your local press for the latest announcements. All you need to pay for is usually for food & drinks and trinkets you would like to buy at the fair. One fun street fair is the weekly one in downtown Huntington Beach Main Street every Tuesday from 5 – 9 PM. Speaking of Fairs, the Orange County Fair in Costa Mesa has started last Friday and will last until August 15th. Apart from all the carnival ride attractions there is entertainment of all kinds. The Ice Museum presented by Carving Ice, features the fair’s coolest attraction. In a 25′ by 25′ ice gallery that’s kept at 15 degrees, the visitor can watch ice sculptures of classic artworks, like the Mona Lisa. So, should you get too hot at a day’s long visit at the fairgrounds , go and cool off at the Ice Museum. Three famous summer art festivals are happening in Laguna Beach at the moment and are fun for the whole family. 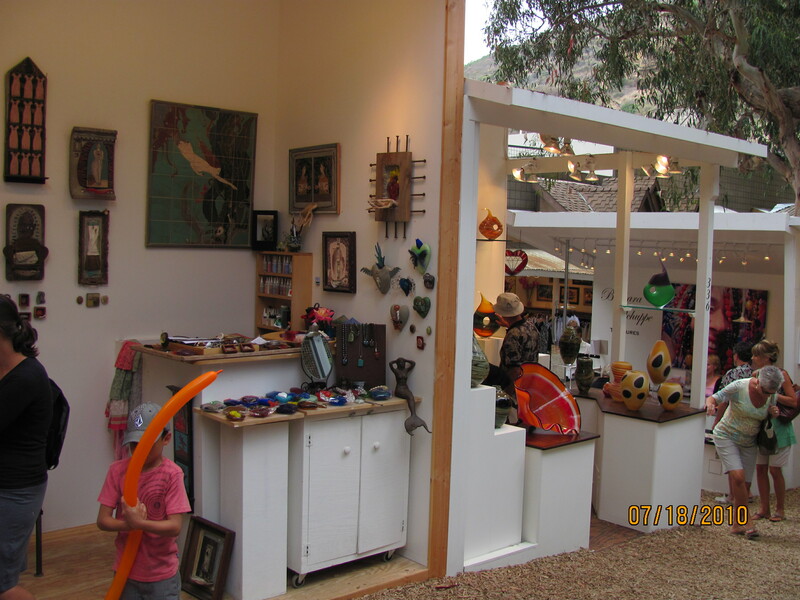 The Festival of the Arts, Sawdust Art Festival and Art-A-Fair. A triple value passport is offered through www.lagunabaechpassport.com or by calling (949)497 0521. For just $19 you receive unlimited admission to all three festivals. Every ticket includes a one-time, all-day free parking! The Festival of The Arts offers a great way for the whole family to spend a whole day immersed into the art world. Start the day with a free guided art tour, offered weekdays (11am & 3pm) weekends (11am & 4pm) . The artists are all present, which makes it easy to chat with them and get to know the person behind the artwork. Sign up for the many daily free art work shops, where you can learn about the various art techniques. Offered are workshops on : Printmaking, RAKU ceramic workshops, and Video 101 FOA (thru august 30th, 10-11am) and more. Every Saturday afternoon there is the Summer Smooth Jazz Concert Series at the Festival of The Arts from 1-3:30pm ( free with Festival Admission $7). In the mood for an exquisite wine tasting? Then don’t miss the Art, Jazz, Wine & Chocolate! Events every Thursday 5-8pm. Experience fine chocolate and wine tasting at its best for a nominal $12 fee in addition to the general Festival admission. (Check out their calendar for the daily events). At night enjoy the show of the Pageant of the Masters. A celebration of art showing world know master pieces as “living pictures”. scrimshaw, photography, and so much more’ (see Sawdust Festival website). Kids love the four stations with ‘hands on art projects’ like the pottery station, where kids but also adults can learn how to make a little piece of clay into a beautiful bowl, vase, etc. If you have enough form the sun and outdoor activities please take a look at the great show at Southern California museums . The Los Angeles Natural History Museum just had the grand opening of its exhibition “Age Of Mammals”, featuring spectacular and rare specimens on display, including a sabor-toothed cat. And at the San Diego Natural History museum at Balboa Park the dinosaurs are loose. Don’t leave before seeing some of the various dinosaur movies in 3-D and check out “Dinosaur Sundays” from 11am to 3pm during the summer, where kids can dig for fossils, create dinosaur art and much more. Another fun dino quest takes place at the Discovery Science Center in Santa Ana. While this is a permanent exhibit throughout the year there are interesting exhibits going on all the time which are well worth visiting as well. Grossology and Tinkertoy as well as the Boing Rocket Lab are current exhibits. Another not to be missed exhibit is the “Mummies of the World” exhibit at the California Science Center in LA. According to the Goethe Institut it “…is one of the largest traveling exhibitions of mummies ever mounted. Based on the work of the German Mummy Project, it features a collection of 150 human and animal mummies dating as far back as 6,500 years.” Admission to the Science Center’s permanent exhibition galleries is free. Tickets for the “Mummies of the World” are $19.50 adult or $12.50 for a child. Call (213) 744-2019 to reserve your ticket or buy them online. Christmas is near. In fact next weekend will be the first Advent! An important date I remember from my childhood, as it meant the most wonderful season of the year was about to start. The dangerously delicious scent of freshly baked cookies filled my and all my friends’ homes. It was the season, where it seemed to be just natural to find some time in the day to sit together with a warm cup of tea or coffee in the hand, chatting and watching the flame of the first candle of the advent wreath magically illuminate the dark filled rooms. I am still on the search for a perfect advent wreath and have yet to find out more about Christkindl markets here in California. The Christmas Festivals, like the Winter Sawdust Festival in Laguna Beach, are probably a close bet. In the meantime get in the mood for Christmas by checking out the regularly updated list of Christmas events. It’s an extra page under ‘Resources’, dedicated to “Christmas 2009″. For everyone who is not interested in rides, there is still plenty to do and to see. Enjoy the fair food from funnel cakes to barbacued turkey legs and of course don’t forget to visit all the booths of all the various merchants. It’s always fun to stroll around. The daily schedule tells you in detail what’s going on the day you are planning to go, http://www.ocfair.com/2009/visitfair/visit_fair.html#. TIP: If you’ll be there on the last day, Sunday April 9th, look out for the presentation by the Club German Cultural Center on the Park Plaza Arts Stage at 10:15 am.